With iOS 5, Apple is thankfully going to add a lot of features that'll solve a lot of problems. One of those features is something we can't wait for: Wi-Fi Sync, which is syncing your iPhone to iTunes wirelessly. Great, right? Not for a developer who's accusing Apple of stealing it from him. "They did say that the iPhone engineering team had looked at it and were impressed. They asked for my CV as well." Blocked from the App Store, Hughes went the Cydia route and released his app to jailbreakers. Wi-Fi Sync worked as promised: you install the app on your phone, a companion app on your computer, pair it up, and you'll be able to sync your iPhone wirelessly through iTunes as if it were plugged in through USB. Even though Hughes wasn't allowed in the App Store, he was still making money off his app (Wi-Fi Sync was $10 and he sold 50,000 copies), so he was happy and doing well. 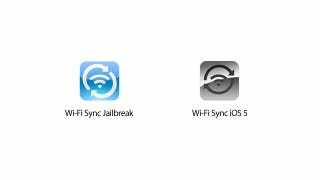 But when Apple introduced their own Wi-Fi Sync feature in iOS 5, with a similar icon, Hughes described himself as "shocked" and said it was "surprising to see that" from Apple. The Register claims that Apple wasn't even subtle in their ripping off of Hughes, using the same name and similar icon. To be fair though, there are only so many ways to say syncing wirelessly (on a similar note, there are only so many ways to say app store) and also only so many ways for Apple to symbolize Wi-Fi sync in an icon (both icons use Apple's representation of syncing and Wi-Fi). It's not as if Apple was taking original names and icons here.